For over 30 years, Beano’s Deli Condiments have been making sandwiches better. 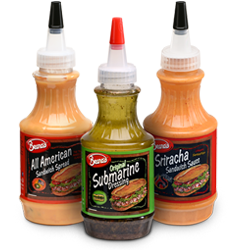 It all started with the Original Submarine Dressing and has grown to a collection of 20+ sandwich sauces. In addition to the wide variety of sandwich sauces offered, Beano’s also carries a line of classical white pizza sauces that add an authentic gourmet Italian flavor to your white pizzas. Additionally, Beano’s has embarked on new territory with their unique product, Sandwich Shakers, a spice blend that allows you to add flavor to your sandwiches without the added fat or cholesterol. With such a large library of sauces to choose from, there’s one for just about any sandwich out there. If you have the sandwich, we most certainly have the sauce!